A fixture in entertainment throughout the second half of the 20th century, a commander of the Ordre des Arts et des Lettres, and Officer of the Legion d’honneur, the recipient of the Médaille Vermeil de la Ville de Paris, Emmy Award winner, and a grand officer of the Ordre national du Mérite, among numerous other awards and honors, Marcel Marceau is widely considered to be the greatest mime of the modern era. Yet, despite his fame as a performer, Marceau’s greatest contribution to society came years earlier during World War II when he worked with the French Resistance. Marceau was born Marcel Mangel on March 22, 1923 to a Jewish family in Strasbourg, France, near the border with Germany. When he was only five years old, he saw his first Charlie Chaplin film, a moment that inspired his later career. In 1939, as Germany was poised to invade France, many of the Jews of Strasbourg were evacuated on short notice. At the age of 16, Marcel and his brother were sent to Perigord, in the south, and eventually they made their way to Limoges. Desiring to become a painter, Marcel enrolled in art school, and within two years, with his brother, he had also joined the French Resistance. Recognizing his artistic talents, the Resistance soon had Marcel making forged identity papers for Jews to help them avoid the camps, as well as false identity cards for Gentiles, showing that young men were younger than 18 years of age, and therefore, ineligible to work as forced labor for the German army. According to Marcel, it was also his “idea to bribe the officials, and make people look much younger in their photos.” While making papers for others, Marcel also forged papers for his brother and himself, changing their last name to Marceau, in homage to one General Marceau from the French Revolution that Marcel recalled reading about in Les Misérables. Among other activities while with the Resistance, toward the end of the war, Marcel also helped a smuggling ring to sneak Jewish children out of France via Marcel dressing up as a Boy Scout leader, leading the Jewish children (also dressed as scouts) through the woods to the Swiss border. Making this trip three times, Marcel successfully secreted more than 70 children to safety into neutral Switzerland, keeping them mollified during the dangerous trek via entertaining them with his pantomime antics. Joining the French Army after France was liberated in 1944, because he spoke English, Marcel was made a liaison officer with the Third Army of the United States (led by General George S. Patton). It is here that he gave his first public performance by entertaining several thousand troops with his pantomime, earning his first American review, in the Army’s Stars and Stripes paper. After the war, Marcel returned to Strasbourg only to learn that his father had been captured in 1944 and killed at Auschwitz. He later enrolled in the School of Dramatic Art at the Sarah Bernhardt Theatre in Paris. Shortly thereafter, he debuted what is perhaps his most famous character, Bip the Clown. Many aficionados claim that pantomime doesn’t “translate” well to film or television and has to be seen live to appreciate it. Perhaps that’s why Marcel is seen in only a handful of films. However, the few film roles he took are memorable. For example, in Mel Brooks’ 1976 comedy, Silent Movie, where the only word spoken in the film was “Non.” Ironically, it was uttered by Marcel. 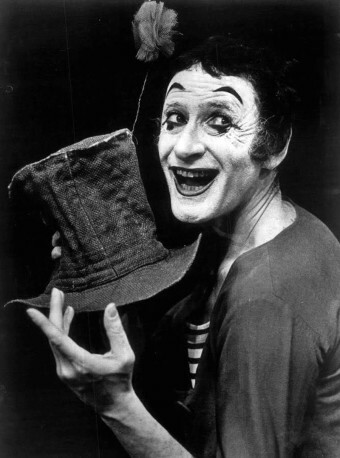 Marceau lived to the ripe old age of 84, dying in September of 2007.